New Acupuncture Clients: please call us, we are excited to hear from you! You can receive a FREE 15 min consultation, this includes an insurance check and a mini Acupuncture treatment focused on stress. No charge – no obligation! If you would like the mini Acupuncture treatment, please budget 45 min for this visit. You can schedule for a New Client Visit; please budget 90+ minutes for this visit. If you have insurance which covers Acupuncture; deductible, co-pay or co-insurance will apply to this visit. If you have an open Worker’s Comp claim or have Oregon Medicaid, you will need an MD referral, please schedule a free 15 min consultation instead and we will give you more information. If you do not have insurance, this visit costs $133 unless you can apply for our financial hardship waiver, please ask us. Our phones are forwarded between the clinics to ensure you are able to talk to one of our office staff team members, Monday through Saturday. If we are busy you will be able to leave a message, we will return your call as soon as possible. For all other visits, please call the office to schedule your appointment to avoid scheduling errors. Budget 60 minutes for your Acupuncture follow-up appointment. 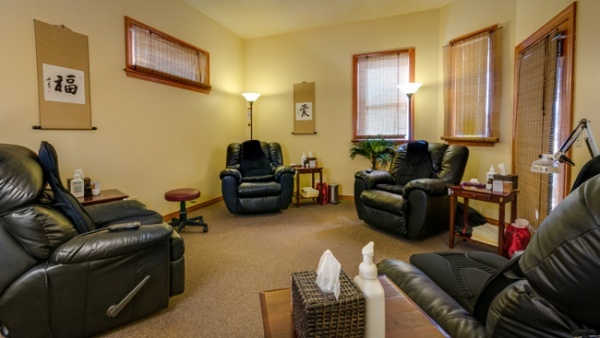 All appointments on the top of the hour and 15 min past the hour are eligible for an individual treatment room on a massage table; all other appointments are in the Big Healing Room in recliner chairs. You will need your Patient Record ID and your date of birth to use the self scheduling option. If you have trouble with online scheduling or do not know your Patient Record ID, please call us and we will be glad to help you. We treat as a team of Acupuncturists who shares all of our clients, however this scheduling system is set up per provider. If you arrive more than a few minutes late we may need to reschedule you as we need to treat the next client. Clients may have to pay $27.50 for missed appointments or cancellations with less than 24 hour notice. Please follow your treatment plan. Remember that frequency and regularity will affect your results. Twice a week is a minimum frequency for the treatment of painful conditions initially. The treatments build on each other, just like Physical Therapy treatments or any exercise routine. In case of illness or vacation we make the best effort to provide services to our clients, however it might be a different practitioner who is covering. We are unable to inform our clients if this happens and apologize for any inconvenience this might cause.